This past weekend, we had the pleasure of attending the Thought Bubble Sequential Art Festival held in Leed, UK. Focusing on art, from the small indie artists to the larger well-known ones, there was something for everyone. A large event with over 400 exhibitors, there was a lot to see, do, and buy. This year it was spread over four venues and included a rainbow road featuring LGBTQIA comics. There was also a free mid-con party held at the wonderful Trinity Kitchen that allowed everyone to let their hair down and mingle with their favourite creators, which was a great experience and tons of fun to be able to attend. But let’s not get wrapped up in the party. We’ll be breaking down the review by the different venues you could wander through. The largest of all the venues with 240 tables, this was the place where it was always hopping. With creators here like Soundimals (James Chapman), Kit Draws (Kit Palmer), Sad Ghost Clube, Webcomic Name, Emily B. Owen, Eat My Paint (Lloyd Davies), there was something for everyone. Writers in this tent, that included Jed McPherson (Deadbeat), Andre Mateus (Anthology: Crime, Hotel Hell, Deciders #1 of Wolf and Men), and Tom Ward (Merrick: The Sensational Elephantman), showcased a range of writing styles that was amazing and constantly catching my eye. There were a few publishers around the area as well, Myriad and Nobrow just to name a couple. The overall venue was well spaced, wonderfully lit, and easy to navigate, even with the crowds were heavy. It was a breeze to find particular creators, and never had the feeling of being trapped in a slow moving crowd. Though this venue was a little bit of a trek to get to, as it was a block away from the other venues. However, a redeeming factor of this is it was right by most of the panels, the cosplay sign up, and hosted a quaint reading room just outside the venue. Eighty exhibitors graced this venue that was located a short walk from the ticket booth. This venue carried a wide selection of artists including Doctor Geof (Fetishman, The Tea Museum), Dan Whitehead (Hexloader, Scooby Doo, Midwinter), Lizz Lunney (Lizzlizz.com) , Timothy Winchester (People I Know, Podcast I Know), Hamish Steele (Pantheon, Deadendia, Moosekid Comics) and Nicolas Delort (illustrator for Penguin, Quirk Books, Blizzard Ent.). The setup was a bright, easy to walk through space, that made it easy to find the creators you really wanted to hit for comics and prints. Considerably smaller than the Comixology venue, there were spots where it got a little congested, but it was easy to get around the stopped or slower moving clusters of people. There really never was a ‘stuck’ feeling in there even when caught behind a slower group. Personally, this was one of my favourite venues to visit and walk around because it featured some of the artists I follow and enjoy the works of. Located just a minute or two’s walk away from the next two venues, this one was easy to find and get to. The second mid-sized venue, also hosting 80 exhibitors was the Leeds Town Hall Marquee. Located right in front of Victoria Hall Marquee, and just across the road from the ticket booth, it was easy to locate and walk to. Arranged in a similar layout to the Cookridge Stree Marquee, it was also easy to walk around even when crowded. This venue hosted creators such as Emmeline Pidgen (illustrator), Ze Burney (Andromeda, Regular Show, Witch Gauntlet), Francis Portela (Ninjak), and Ned Heartly (Heartless Comics). This venue also hosted Forbidden Planet, Afterlight Comics, Dead Canary Comics, Muster Press, and Level-8 Comics. A wide range of talent could be found in this area, from the indies to the stores with the current popular titles out. This venue also featured signing tables, which were cleverly located along the outer edge of the venue, with the queues for the tables on the outside not taking up much traffic space. Walking around this venue could be a little different at times, as it was built up to make the slope of the ground level. However, the bouncy floor did not take away from the wonderful range of creators inside. The smallest venue of the event, hosting just sixty tables, was also the grandest. Situated inside the beautiful town hall at the top of a long set of stairs, you could feel the history of the building as soon as you entered. This was the place to be for a few panels, and to see the acclaimed Gerard Way (Shade, Doom Patrol, Mother Panic). The dimmer light in here allowed you to focus on each table instead of being distracted by all the colour and shine from all around. The range in here was just as great as the other venues, with creators H-P Lehkonen (Immortal Nerd, Short Gay Stories), Lucian Stephenson (Ars Goetia, Salome, Where Am I, If Not Here? ), Sarah Gordon (Queen Rat, Strip), and Matt Swan (Magic Hour, Bat Princess, Parsley Girl). Publishers included Avery Hill, Dragonhoard, Disconnected Press, and Otto Press. Spaced beautifully, and with the queue for Gerard Way coming from the outside and not taking up traffic room, it was easy to navigate around and admire all the great work. Even with panels and demonstrations happening just on the other side of the room, it was never too loud to converse easily with creators and other con attendees. The sheer amount of talent at this convention was a little overwhelming at times, with so much great art, comics, and books to pick from. Every creator was wonderful to talk to and share in the joy of comics with. One of the highlights of this con was the sheer range of artists, from the niche indie artists to the big name writers and illustrators. Even with having to walk from venue to venue, it wasn’t bad and was a nice break between the crowds to catch a fresh breath of air or to pop over to a cafe and grab a bite to eat. Security was a top priority at this convention, with bag checks at every venue. While this naturally can be a little tedious, the queue moved quickly and you were never stuck waiting very long to enter. Though this was an art-focused convention, there were a number of cosplayers in attendance. The costumes ranged from Homestuck to Rick and Morty to Hagrid and Minerva McGonagall to Beetlejuice. The creativity and professionalism put forth by the cosplayers here rivalled many of the larger cons that I have attended. There were more cosplayers in attendance the second day of the con rather than the first, which is a bit unusual for a two-day convention. It seemed that the best was saved for last, as the second day is when it seemed everyone brought out their big creations, like a full-sized BMO from Adventure Time. Overall, this was a great way for me to jump into the comic convention scene in the UK, and just a great con in general. The atmosphere was inviting, and there was a comic, print, or zine for all walks of life. A truly enjoyable experience that I cannot wait to experience again. 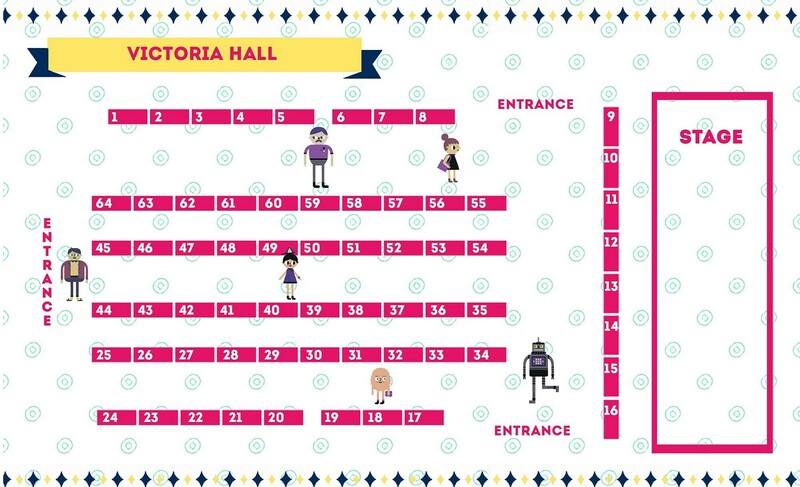 If you want to know more about Thought Bubble or want to get a head start on next year, visit the site at thoughtbubblefestival.com.